I once wanted to win a toy on the rifle range at the fair. (I should point out, this was quite a few years ago!). To win, I had to fire wet sponge pellets at a cuckoo clock bird. If I fired when the doors were shut, the pellet just bounced off. To ‘hit home’ I had to wait until the doors were open, and fire before they closed again. Later, as a therapist, I realised that people’s minds need to be open before new ideas can properly ‘hit home’. How often have you read under ‘what is hypnosis?’ on a hypnosis FAQ something like: “Hypnosis is simply a state of deep relaxation…”? This is reassuring to the cautious public, perhaps, but far from the full story! If you only have one way of inducing hypnosis – the undoubtedly pleasant path of relaxation- then you are considerably less flexible as a therapist than you could be. Because hypnosis is about focus. We can get people to focus by gently lulling them into deep calm (relaxation) or we can use other ways. Such as shock. The great Dr Milton Erickson describes how he sometimes used shock to induce altered (and more suggestible) states of consciousness within his patients. Warning: What you’re about to read may shock you! A young couple who couldn’t conceive came to see the great Dr Erickson. They were very proper, articulate, college professors, very serious. They described how they had failed to produce children, how ‘marital union’ with ‘full physiological concomitants to fulfill our philoprogenitive desires’ had ‘failed to produce offspring’. After listening to their account, Erickson said he believed that they could be cured by shock therapy. If they agreed to this, they must further agree that, following their shock, they must return home in complete silence, so that the effects of the shock would not be diluted. Somewhat bemused, the couple agreed. Three months later, the wife was pregnant. 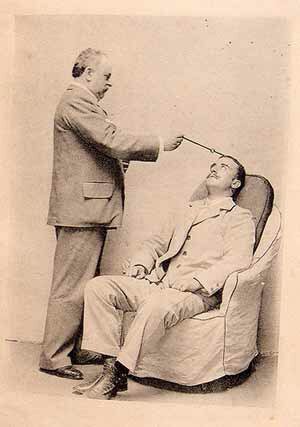 Hypnosis may not look like ‘hypnosis’. The ‘eyes wide and glassy’ look, lasting only a couple of seconds, may be just as receptive a state for new ideas to take root as its thirty minute ‘eyes closed in relaxation’ cousin. The door doesn’t need to be open very long for the wet sponge to hit home. Once you understand the principle of shock (technically, it fires the brain’s ‘orientation response’, instantly increasing suggestibility), you can use it creatively. So here’s a few pointers to help you incorporate surprise as part of your therapeutic approach. Sometimes something new is needed. They’ve heard all the advice, had all the cognitive reframes, sat through all the fancy techniques, been to more therapists than Elizabeth Taylor’s had husbands, and know more psychobabble than you do. What will capture this person’s attention long enough for a genuinely fresh idea to settle undisturbed? Appearing to agree with any negative statements your client makes can cause such startled surprise as to make them temporarily open to new therapeutic ideas. When you have no idea what is happening, and therefore what is going to happen next, you become open to suggestion. People totally confused by the stage hypnotist unexpectedly tipping them backwards become immensely suggestible. Such a construction causes confusion in the mind, leading to a frantic search for clarity, which is then delivered by the direct suggestion. In its relief at hearing something it can at last understand, the mind immediately accepts the suggestion. Use this sparingly and carefully. NB Notice that, confusing as the language is, there is still an underlying logic to it. In this context, ‘confusing’ does not (and should not) signify ‘meaningless’. Humour is one of the oldest (and best) ways of presenting new perspectives, because it utterly disarms people’s defenses. Used at the right time, in the right way, it can have a huge effect. I once had a client who needed investigative surgery and was very worried that she might ‘be aware and feel everything, but not be able to move’ while under the anesthetic. Having established excellent rapport with her, I didn’t try to argue with her about this, but went for the humorous approach instead. I can still recall the look of surprise on her face, and how she burst out laughing. The shock I gave her with my bet helped deliver a new frame of reference that put her anxiety in perspective and enabled her to go calmly through the surgery – noticing nothing, of course. So unexpected agreement, confusion and humor can quickly open minds to new ideas. Used selectively and carefully, they can both broaden and deepen your therapeutic range. Just remember not to overdo it with shock – otherwise you will lose the element of surprise! My advanced course ‘Precision Hypnosis’ teaches shock hypnosis in much more detail, including live therapy footage of it in use. 4 Simple Steps That Boost Your Therapy Clients’ Willpower 3 Core Hypnotherapy Techniques Every Therapist Should Know The Most Important Psychological Insight I Ever Learnt Does Hypnosis Work, Really?